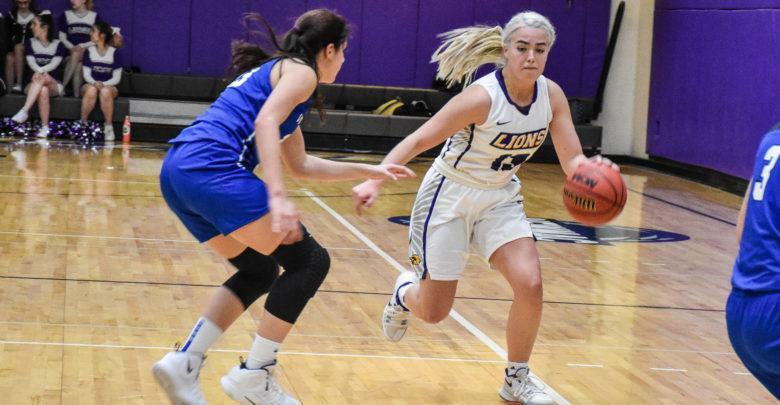 The Emerson women’s basketball team dominated Wellesley College 73-56 on Wednesday night in its conference opener with the help of junior guard Natalie Clydesdale’s 21 points. Last season, Emerson opened conference play against Wellesley but lost the game 61-53. This time, the Lions responded with an emphatic 17-point win. Clydesdale said the win will send a message to the rest of the New England Women’s and Men’s Athletic Conference. While both teams shot efficiently from the field in the first quarter, the Lions emerged with a slim 16-14 lead at the end of the quarter. Emerson continued their great shooting in the second quarter as they finished halftime with a 33-24 lead after a buzzer-beating layup from sophomore forward Sam Boyle. Wellesley fell flat in the quarter—shooting just 25 percent from the field and committing six turnovers. The Lions erupted in the third quarter as they went on a 16-2 run that extended their lead to 19; however, the Blue closed the distance to end the quarter at 51-38. Early in the fourth quarter, the Blue cut the lead to an eight-point deficit at 51-43. The Lions then responded with a 14-1 run, which saw them make three consecutive three-point shots, to finally put the game out of reach. Gould credited Wellesley for keeping the game relatively close early in the fourth quarter but said the Lions hit the necessary shots to keep the lead. The Lions had four players in double-digit scoring, and the bench unit combined for 24 points. Clydesdale led the team with 21 points while junior guards Kate Foultz and Quinn Madden and sophomore guard Rachel Davey all added 12, 11 and 10 points respectively. Throughout the game, the Lions shot well from the field as they kept the ball moving and found quality open shots. They made 58 percent of their shot attempts, including a scorching 11-of-19 from the three-point line, and had 22 total assists. Their defense kept the Wellesley offense from coming back into the game as the Blue shot just 39 percent from the field and committed 23 turnovers. “I think we really played well defensively, and we were very scrappy at the defensive end and that gave us an opportunity to kind of settle ourselves down a little bit on the offensive end and get really good shot opportunities,” Gould said. With the win on Wednesday, the Lions now hold a 4-2 record. They will play Worcester Polytechnic Institute on Dec. 1 at 2 p.m. for their second conference game of the season.